It has been a very busy summer and early fall for Continental Properties Company. At the outset of the year we set very aggressive goals for new apartment community groundbreakings, and the past several months have been very exciting! Since spring 2014, we’ve broken ground on 6 new communities, with plans to open each of them in 2015. Located at MacAurthur and Memorial, just south of the John Kilpatrick Turnpike, Springs at Memorial Apartments will be our first community in Oklahoma City. Major employers within 10 minutes from the community include Mercy Health Center, Oklahoma Heart Hospital, Procure Proton Therapy Center, Paycom, and several others in the Gallardia Corporate Park. The community also offers convenient access to other major employment centers such as the Memorial Road corridor, the I-35 corridor, and downtown Oklahoma City. There are a variety of dining options located within walking distance of the property, including local favorites such as Interurban Restaurant, Hideaway Pizza, and Earl’s Rib Palace. Convenient shopping options are less than 1.5 miles from the community, with additional shopping, dining, and entertainment located just 3 miles east at Quail Springs Mall. We broke ground on this 228-apartment community in August 2014, and expect to have our first building available to residents in early spring 2015. Located at South Mingo Road, just west of OK 169, Springs at Woodlands South Apartments will be the second community we’ve developed in Tulsa. Employers located less than 5 minutes from the community include Cancer Treatment Center of America, Hillcrest South Hospital, St. Francis Hospital South, and Tulsa Community College. Other major employers within 15 minutes include University of Oklahoma-Tulsa, Total Medical Personnel Services, and Citgo Pipeline. Residents will have access to tons of nearby entertainment, shopping and restaurants. There are an abundance of dining options available within 5 minutes of the community and the Woodland Hills Mall, located 1 mile northwest of the community, contains more than 165 stores. We broke ground on this 288-apartment community in August 2014, and expect to have our first building available to residents in spring 2015. Springs at Estero Apartments is located in the Naples/Fort Myers area, on Ben Hill Griffin Parkway just east of I75, and will be the first community we’ve developed in southwest Florida. Major employers within 5 minutes of the community include the new Hertz headquarters, Florida Gulf Coast University, CLW Construction Inc., and the Germain Arena. Other major employers within 20 minutes include Chico’s FAS headquarters, NCH North Naples Hospital and 21st Century Oncology headquarters. Residents of Springs at Estero will enjoy the ample shopping, dining, and entertainment options that are available at the Miromar Outlets, Coconut Point Town Center, and Gulf Coast Town Center. The Miromar Outlets and surrounding neighborhood offer several national restaurant chains, as well as local favorites Luna Rossa Italian Grille and Waterside Seafood and Grill Company. We broke ground on this 260-apartment community in September 2014, and expect to have our first building available to residents in summer 2015. Located on South May Avenue just east of I44, Springs at May Lakes Apartments is our second community in Oklahoma City. Major employers within 10 minutes of the community include Community Hospital, Oklahoma City Community College, Mid-America Christian University, St. Anthony South, and the Oklahoma City Police Department. Residents will have several convenient neighborhood shopping amenities less than 1.5 miles from the community, along with access to many national restaurant and retail chains. For residents that are looking for some recreation, the Earlywine Park YMCA & Aquatic Center is just 1.5 miles south of the community. We broke ground on this 304-apartment community in September 2014, and expect to have our first building available to residents in late summer 2015. Located just off Hickman Rd., Springs at Waukee Apartments is our second community in the Des Moines metro area. 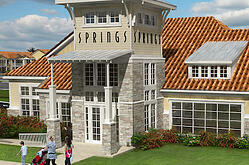 Residents of Springs at Waukee will enjoy plentiful nearby employment, recreation, shopping and dining opportunities. Less than two miles west of the community is the Waukee Family YMCA, while a brand new Lifetime Athletic is six minutes east. Major employers within 15 minutes of the community include Wells Fargo, Aviva USA, and Allied Insurance. Additional employers are located in the business parks near intersections I-35 and Hickman Road and I-35 and I-80. Ample shopping, dining and entertainment is available at Valley West Mall and Jordan Creek Town Center, both located less than seven miles away. We broke ground on this 260-apartment project in April 2014 and expect to have our first building ready for residents in early 2015. Located on Egan Drive in the Twin Cities’ South Metro, Springs at Egan Drive Apartments is our first community in Minnesota. Residents of Springs at Egan Drive will enjoy plentiful nearby employment, recreation, shopping and dining opportunities. Many neighborhood shopping and dining options are located less than one half mile west of the property, and Lifetime Fitness athletic club is located within walking distance. Major employers within ten minutes of the community include St. Francis Regional Medical Center, Michels Corp., Shutterfly, Datacard, and several other growing companies in the Dean Lakes Business Park. The community also offers convenient access to other major employment centers such as the Mall of America area in Bloomington, the I-494 corridor in Eden Prairie, and downtown Minneapolis. We broke ground on this 288-apartment community in May 2014 and expect to be ready for our first residents in early 2015. As you can see, the past few months have been very busy for the development, construction, and property management teams at Continental Properties! To learn more about each location, including how to secure a spot, please contact one of our Resident Services representatives.